Booklet printing in Metro Detroit, Michigan. 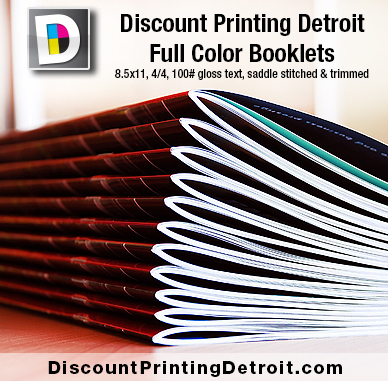 Businesses all over the Metro Detroit area have been getting their full color booklets printed with Discount Printing Detroit. High quality off-set printing on 100# gloss text makes for an outstanding finished product that will help you communicate your message or help sell your products. Our booklets are full bleed, full color, saddle stitched and edge trimmed for the most professional look possible. We also offer smaller runs via our high quality digital printing option. From Detroit to Southfield to Royal Oak to Troy and everywhere in between, trust us to print your booklets on time and at a great price!